Manufactured to the latest industry standards you can install this cable outside (when protected) or inside. This 'Siamese cable' features integrated co-axial (RG59) and DC power in one convenient roll, so you can easily and reliably extend the range of your camera's video and power signals. Run images from your CCTV camera further without the loss of signal thanks to improved shielding and insulation within the cables. It's easy to use with sturdy metal connectors that lock tight, for an easy 'plug & play' installation. The pack also includes a female to female BNC adaptor making joining cables a breeze. The other end of the cable roll easily connects to your camera's existing power adaptor and the BNC input of your DVR or recording device. An all-weather, Super high resolution 720p Dome CCTV camera with 20 25m night vision, designed to be used with the Homeguard CCTV range. With an adjustable bracket, made for wall or ceiling mounting, includes fixings and an 18.3m (60ft) power / video cable ensuring the Homeguard Dome CCTV Camera can be mounted in the optimum outdoor or indoor position. Meets the IP66 standard ensuring the product is weatherproof. This pack contains two springs and two safety cables.Ideal Security Garage Door Extension Springs are designed for standard 7' high garage doors. They provide additional lifting power for manual and electric garage doors. Our springs are original equipment quality, made to last for many years.Safety cables reduce the risk of damage and injury if the springs or fastenings break.Garage door springs are colour-coded to indicate weight capacity. Our springs follow industry-standard colour coding. If your current springs are blue, ensure that you know your door weight or spring diameter before ordering.You should replace your springs with the same size as the original. You can use our handy Spring Selection Guide to ensure you choose the right springs for your door. If your springs sag or are longer than 25" in the relaxed position, it may be time to replace them. It's important to always change your springs in pairs to maintain proper balance, and to always install safety cables.Before buying, please watch our how-to videos to ensure you're comfortable doing the work yourself. This security camera features Swann's True Detect PIR Thermal-Sensing technology to reliably detect heat-generating moving objects, such as people, large pets & cars. With more accurate motion detection you have more reliable notifications & recording, eliminating false triggers such as falling leaves, bugs, rain & more, saving you hard drive space & playback time. The sturdy polycarbonate camera construction is weatherproof and can be used both outdoors and indoors plus, with the camera's powerful infrared night vision, see in the dark up to 100ft (30m). The camera comes with a roll of 60ft (18m) BNC cable to connect it to the DVR. 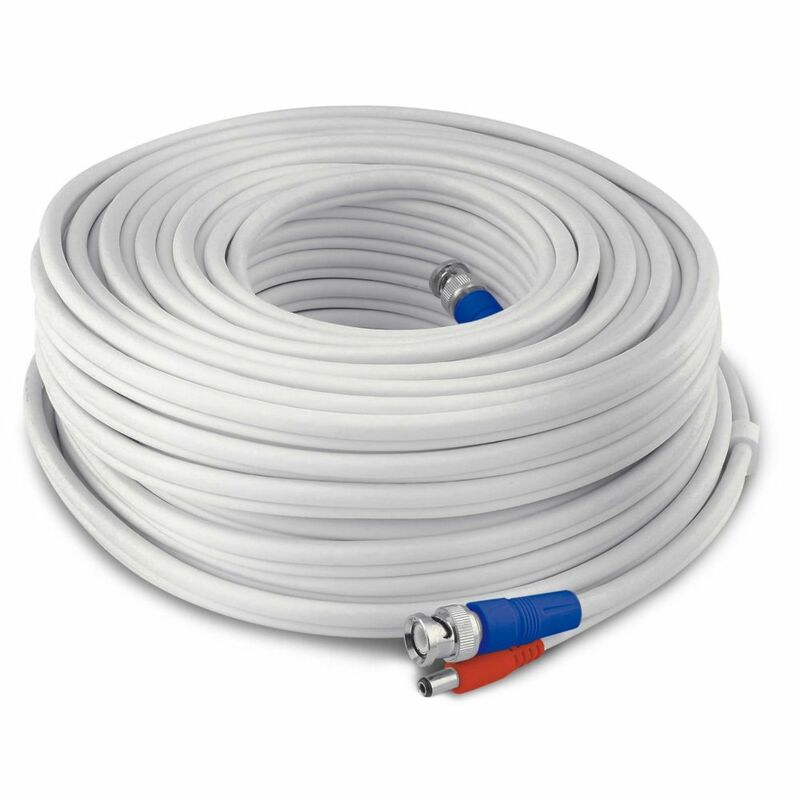 HD Video & Power 50ft / 15m BNC Cable Manufactured to the latest industry standards you can install this cable outside (when protected) or inside. This 'Siamese cable' features integrated co-axial (RG59) and DC power in one convenient roll, so you can easily and reliably extend the range of your camera's video and power signals. Run images from your CCTV camera further without the loss of signal thanks to improved shielding and insulation within the cables. It's easy to use with sturdy metal connectors that lock tight, for an easy 'plug & play' installation. The pack also includes a female to female BNC adaptor making joining cables a breeze. The other end of the cable roll easily connects to your camera's existing power adaptor and the BNC input of your DVR or recording device.